Osun Election Inconclusive; What Are The Implications? The September 22 governorship election in Osun state has officially been declared inconclusive by INEC, Naija News reported. Joseph Afuwape, returning officer of the election, who announced this, said the requirements for a candidate to be returned as winner were not met. 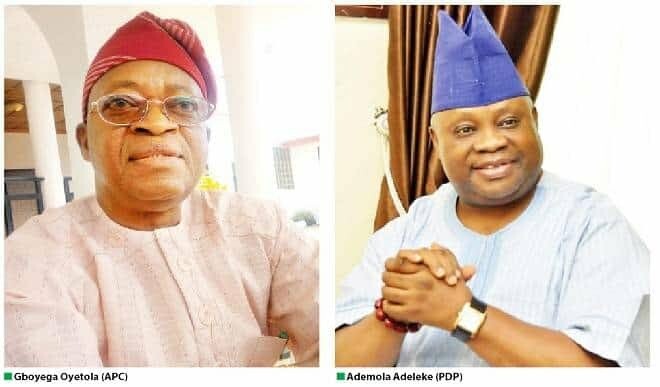 Ademola Adeleke, candidate of the Peoples Democratic Party (PDP), had emerged with majority vote of 254,698 while Isiaka Oyetola of the All Progressives Congress (APC) followed with 254,345 votes, leaving a difference of 353. This difference is far higher than the cancelled 3,498 votes recorded in the election. What is an inconclusive election? It is an election where the total number of registered voters in units where the results are cancelled or where the elections are postponed, are sufficient to cause a change in the outcome of the election. What are cancelled votes? Cancelled votes are votes that were annulled based on irregularities or anomalies during election. It is the Independent National Electoral Commission (INEC) that has the right to cancel votes. However there is a big difference between cancelled votes and voided votes, though some people use them interchangeably. Voided votes are votes that are not counted because of certain mistakes. For instance, if a voter thumbprints on the portion meant for two parties on a ballot paper, the electoral official has the right to declare such vote void. A voter can only cast his ballot for one party. Now, INEC has fixed Thursday for a re-run election in Osun. The implication of this is that voting will take place in affected areas all over again. A re-run election is an election conducted when the first one was marred by malpractices or when correct procedures were not followed. For instance, declaring an election inconclusive because of the number of polling units were the votes were cancelled. According to electoral rules, a re-run election can be so declared if the margin of victory in an election is lower than cancelled votes. However a run off election is also different from a re-run, this ( re-run) is an election conducted when the first election fails to produce a clear winner for the position of president or governor. This can happen when the candidate with the highest votes does not have the required vote spread in the affected state/federation. A run-off will involve just the two leading contenders.